STAY AWAY FROM "THE SHACK"
Well now, at least Apprising Ministries agrees on the fertilizer part. So as a service to our readers we draw together into this one source some of what we consider to be the better reviews and discussions about this book. My advice: Stay away from The Shack. Peterson’s mystic musings aside, here’s a far more accurate assessment concerning why you should stay away from The Shack by Tim Challies. Another reviewer warns that many Christians will find the book difficult to read because of their “modern” mindsets. “If one is coming from a strong, propositional and, perhaps, fundamentalist perspective to the Bible, this book certainly will be threatening.” Still another says “This book was so shocking to my ‘staid’ Christianity but it was eye opening to my own thoughts about who I think God is.” At several points I felt as if the author was encouraging the reader to doubt what they know of Christianity—to deconstruct what they know of Christian theology—and to embrace something new. But the faith Young reconstructs is simply not the faith of the Bible. You can read Challies’ full in-depth deconstruction of The Shack here. You can download and/or listen to that program here. I heard similar deceptions at Gorbachev’s 1997 State of the World Forum. At the time, keynote speaker Marianne Williamson was touting the Kabbalah, not A Course in Miracles (ACIM). While those New Age “insights” would fit both, they are best expressed through ACIM, which Williamson is now popularizing through Oprah Winfrey’s weekly radio program. Matt Slick of CARM also discusses The Shack and interviews author William Young on his CARM Radio Show Podcast, which you can download here. J.P. Holding of Tektonics, who was one of the very first people to ever pick up an article of mine, weighs in with his review of The Shack, which you can read right here. Dr. Norman Geisler and Bill Roach also demolish The Shack in their short, but thorough, analysis here. One of the most popular and controversial Christian books of recent years is the fictional work by first time author William Young. Evangelical recording artist Michael W. Smith states, “The Shack will leave you craving for the presence of God.” Author Eugene Peterson believes “this book has the potential to do for our generation what John Bunyan’s Pilgrim’s Progress did for his. It’s that good!” On the other hand, seminary president Al Mohler says the book “includes undiluted heresy” and many concur. Given its popularity (number one on the New York Times bestseller list for paperback fiction), influence and mixed reviews, we need to take a careful look. As a novel, while well written, its storyline is not one that would attract many people. The plot is developed around the abduction and murder of six year old Missy, beloved daughter of nominal Christian Mackenzie Philips (Mack). This great tragedy has, of course, shaped the lives of Mack and his family in horrific ways. Mack’s life is simply described as living under “The Great Sadness.” Then one day four years later God drops Mack a note in his mail box and invites him to the isolated shack where Missy was murdered. Obviously skeptical, Mack takes a chance that God might really show up and heads alone to the shack. There God, in the form of all three members of the Trinity, meets with him for the weekend. God gives Mack new insight about Himself, about life, pain and tragedy and Mack goes home a new man. interesting dialog takes place as members of the Trinity take turns explaining to Mack what they want him to know. “sometimes” but often Young totally misses the mark. Young’s message centers on the Trinity and salvation, but before we tackle Young’s main objective it is significant that he has a couple of axes to grind concerning the Bible and the church. Young passionately rejects the cessationist view of Scripture which his character Mack was taught in seminary: “In seminary he had been taught that God had completely stopped any overt communication with moderns, preferring to have them only listen to and follow sacred Scripture, properly interpreted, of course. God’s voice had been reduced to paper, and even that paper had to be moderated and deciphered by the proper authorities and intellects…Nobody wanted God in a box, just in a book” (pp. 65-66). Young would prefer a God who communicates with us in our thoughts rather than on paper (i.e. the Bible) (p. 195). Realizing the subjectivity of such revelation he assures us that we will “begin to better recognize [the Holy Spirit’s] voice as we continue to grow our relationship” (p. 196). Scripture comes in second to inner voices in Young’s theology. The Bible puts God in a box; inner voices make God alive and fresh. This is what Young wants to convey. God (p. 91). He consistently depicts the activity of the church in a negative light: Mack is pretty sure he hasn’t met the church Jesus loves (p. 177), which is all about relationships, “not a bunch of exhausting work and long list of demands, and not sitting in endless meetings staring at the backs of people’s heads, people he really didn’t even know” (p. 178). Sunday school (p. 98) and family devotions (p. 107) both take hits as well. Systematic theology itself takes a postmodern broadside as the Holy Spirit says, “I have a great fondness for uncertainty” (p. 203). While Scripture does not place such words in the mouth of the Holy Spirit, Young’s love for uncertainty becomes frustratingly clear as he outlines his concept of salvation. When Mack asks how he can be part of the church, Jesus replies, “It’s simple Mack, it’s all about relationships and simply sharing life” (p. 178). On an earlier occasion Jesus tells Mack that he can get out of his mess “by re-turning. By turning back to me. By giving up your ways of power and manipulation and just come back to me” (p. 147). Yet nowhere in The Shack is the reader given a clear understanding of the gospel. When Mack asks God what Jesus accomplished by dying Mack is told, “Through his death and resurrection, I am now fully reconciled to the world.” When pressed to explain, God says that He is reconciled to “the whole world,” not just the believer (p. 192). Does this mean that all will be saved? Young never goes that far, however he certainly gives that impression when Mack’s father (who was an awful man and showed no signs of being saved) is found in heaven (pp. 214-215), when God says repeatedly He is particularly fond of all people, when God claims that He has forgiven all sins against Him (e.g. 118-119), that He does not “do humiliation, or guilt, or condemnation” (p. 223) and, contrary to large hunks of Scripture, God is not a God of judgment. “I don’t need to punish people for sin, sin is its own punishment, devouring you from the inside. It’s not my purpose to punish it; it’s my job to cure it” (p. 120). While Young’s comment has some validity it does not faithfully reflect the teaching of Scripture which portray God as actively involved in the punishment of sin. Young further muddies the waters as he has Jesus reply to Mack’s question, “Is that what it means to be a Christian?” Jesus says, “Who said anything about being a Christian? I’m not a Christian…Those who love me come from every system that exists. They were Buddhists or Mormons, Baptists or Muslims, Democrat, Republicans and many who don’t vote or are not part of any Sunday morning or religious institutions… I have no desire to make them Christians, but I do want to join them in their transformation into sons and daughters of my Papa, into my brothers and sisters, into my beloved.” With Mack we are confused. “Does that mean,” asks Mack, “that all roads will lead to you?” Jesus denies this but then says, “What it does mean is that I will travel any road to find you” (p. 182). Jesus apparently means that He will travel any road to “join them in their transformation.” The implication is that people are on many roads that lead to their self-transformation. Jesus will join people where they are on that road and apparently aid in that transformation. This is certainly not the teaching of Scripture, which tells us that we must come to the one road, the narrow way that leads to God through Jesus Christ. 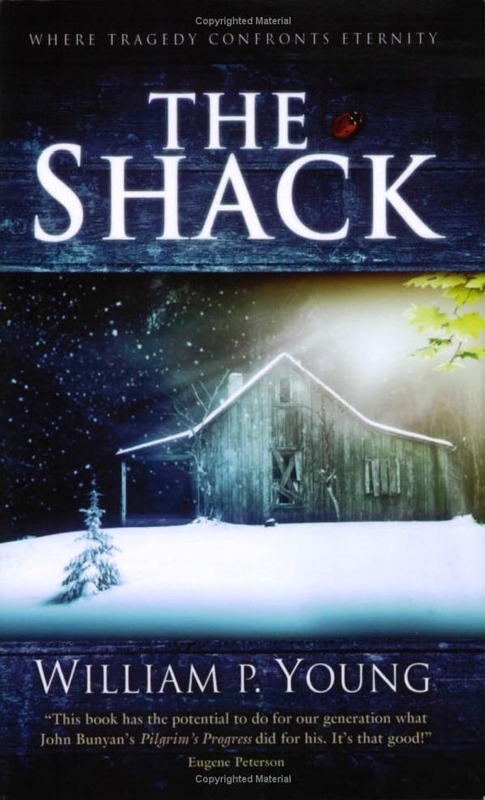 the right relationship with God is cloudy at best in The Shack. Young’s Trinity is equally confusing. The author does not develop his understanding of God exclusively from Scripture and, in fact, often contradicts biblical teaching. The first issue is that of imagining and presenting human forms for the members of the Trinity. While some slack might be given for Young’s portrait of Jesus, who came in human form (although we don’t know what He looks like), the first two of the Ten Commandments would forbid us depicting the Father or the Holy Spirit in physical form. When we create an image of God in our imagination we then attempt to relate to that image—which is inevitably a false one. This is the essence of idolatry and is forbidden in the Word. Further, the portrayal of God throughout the novel is one which humanizes Him rather than exalts Him. Young quotes Jacques Ellul, “No matter what God’s power may be, the first aspect of God is never that of absolute Master, the Almighty. It is that of the God who puts Himself on our human level and limits Himself” (p. 88). Really? This quote is in contradiction to the entirety of biblical revelation which first and often declares God to be absolute Master, yet in no way mitigates the incarnation, as Young and Ellul are trying to claim. Young further humanizes God and contradicts Scripture by teaching that all the members of the Trinity took human form at the incarnation: “When we three spoke ourself into human existence as the Son of God, we became fully human” (p. 99). Is Young advocating modalism (an ancient heresy which teaches that the Trinity is not composed of three distinct members but three distinct modes in which God appears throughout human history)? If not, it is abundantly clear that Young believes that the Father died on the cross with the Son and bears the marks of the cross to this day (pp. 95-95, 164). He also does not believe that the Father abandoned Jesus on the cross as Scripture declares (p. 96). And any concept of authority and submission in the Godhead is denied (pp. 122, 145), although 1 Cor. 11:1-3 is clear that such authority/submission exists. More than that, God submits to us as well (p. 145). By the end of the book God is reduced to being our servant as we are His (it’s all about relationships, not authority) (pp. 236-237). The very essence of God is challenged when Young, quoting from Unitarian-Universalist, Buckminster Fuller, declares God to be a verb not a noun (pp. 194, 204). In a related statement, Young has Jesus say of the Holy Spirit, “She is Creativity; she is Action; she is Breathing of Life” (p. 110). Yet the Bible presents God as a person (noun) not an action (verb). When this truth is denied we are moving from the biblical understanding of a personal God to an Eastern understanding of God in everything. Thus, we are not surprised when Mack asks the Holy Spirit if he will see her again he is told, “Of course, you might see me in a piece of art, or music, or silence, or through people, or in creation, or in your joy and sorrow” (p. 198). This is not biblical teaching. This idea seems repeated in a line from a song Missy creates, “Come kiss me wind and take my breath till you and I are one” (p. 233). At what point do we become one with creation? Again, this is an Eastern concept, not a biblical one. Young reinforces his Eastern leanings with a statement right out of New Age (New Spirituality) teachings: Papa tells Mack, “Just say it out loud. There is power in what my children declare” (p. 227). Rhonda Byrne would echo this idea in her book, The Secret, but you will not find it in the Bible. Further, we are told Jesus “as a human being, had no power within himself to heal anyone” (p. 100). So how did he do so? By trusting in the Holy Spirit. Jesus, the Spirit says, “is just the first to do it to the uttermost—the first to absolutely trust my life within him…” (p. 100). There is enough truth here to be confusing but not accurate. Jesus, never ceasing to be fully God, had all Divine power dwelling within Him. That He chose to limit His use of that power and rely on the Holy Spirit while on earth in no way diminishes His essence. While Jesus is our example He is not a guru blazing a trail in which in this life we too can be like God. This idea smacks of New Age teaching, not Scripture. Jesus even tells Mack that “God, who is the ground of all being, dwells in, around, and through all things—ultimately emerging as the real” (p. 112). This is pure New Age spirituality. The Shack, while occasionally getting things right is, in the end, a dangerous piece of fiction. It undermines Scripture and the church, presents at best a mutilated gospel, misrepresents the biblical teachings concerning the Godhead and offers a New Age understanding of God and the universe. This is not a great novel to explain tragedy and pain. It is a misleading work which will confuse many and lead others astray. 1 God “in” everything is known as panentheism—an Eastern belief akin to pantheism which teaches that God IS everything. In reality there is very little difference between the two. The review appears in its original form here.